Two new trios from Boston based pianist-composer-educator Pandelis Karayorgis, both recorded in informal house sessions last summer. Pandelis Karayorgis and drummer Eric Rosenthal share a long musical relationship dating back to the early nineties. For this session they are joined by double bass player Damon Smith who has recently relocated to the Boston area and has played with both several times over the past couple of years. Cliff captures their first, free-improvised encounter as a trio on a hot July day in Cambridge. Karayorgis was in charge of the recording, mixing and the cover art. The four extended pieces explore different aspects of a resourceful improvising unit dynamics as density, energy, timbre and palette of sounds, tension building and release, texture and pulse. From the first second of this session, this trio sounds as willing to take more and more risks, literally - as if it hangs from a huge cliff. Karayorgis and Rosenthal completes each other gestures in a fast and muscular flow, and often both play as a tight, organic unit. Smith adds a subversive dimension to this session. He refuses to follow or intensify any pulse, loose as it may be. He insists on confronting and sometimes even provoking the immediate interplay of Karayorgis and Rosenthal with his inventive suggestions -including a total different perspective of this trio syntax and harmonic possibilities - articulated with masterful, extended bowing techniques and rich palette of deep-toned sounds. The tension that Smith introduces to the interplay keeps this trio from falling down from the adventurous cliffs it has explored. 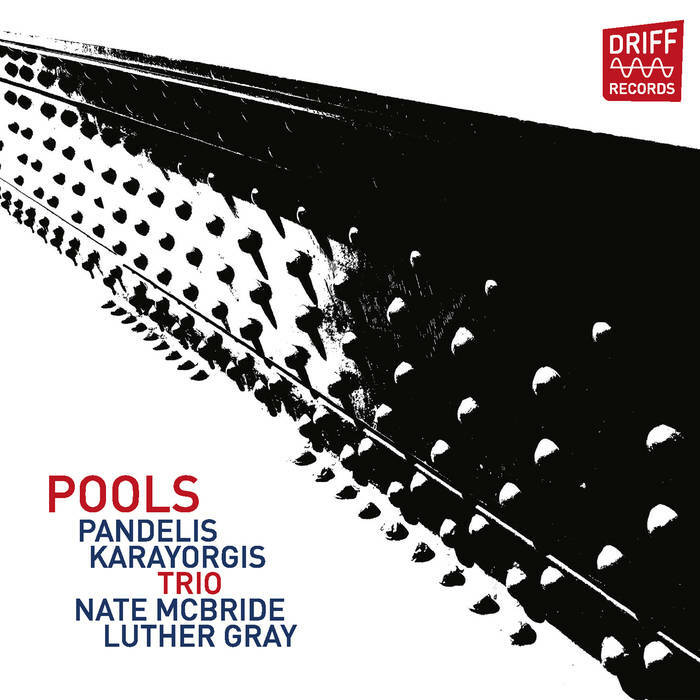 Pools reunites Karayorgis with long-time comrades from past piano trios and other outfits. 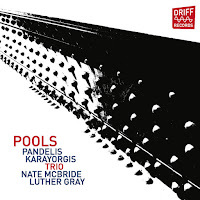 Bass player Nate McBride has played in Karayorgis' trios with drummers Randy Peterson and Curt Newton. Drummer Luther Gary has played in another trio of Karayorgis with bass player Jef Charland. 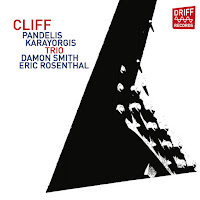 McBride and Gray play also with Karayorgis in the quintet Cutout and recently have collaborated again in a quintet led by guitarist Jeff Parker. This new trio was recorded too in July 2018 in Cambridge. Karayorgis wrote all the pieces except for a free-improvised piece and a variation on a blues theme, and, again, recorded and mixed the session and did the cover art. This trio emphasizes the concept of restrained intensity, a three-way dialogue that enjoys the strong musical bond that these three musicians have established over the years. This informal session is an opportunity for this trio to stretch out and refine its shared language and common pool of ideas. The free-improvised piece, the most intense one here, “Last one”, captures best the immediate flow and exchange of ideas between Karayorgis, McBride and Gray in a true democratic interplay. The other pieces offer different dynamics and textures. This trio rages through the opening “Roll”; enjoys a loose ballad on “How Daisies Jiggle”; playing with fast-shifting rhythmic patterns on “Entanglement”; explores a minimalist, ritualistic texture on “allbyitself” , that introduce the following, playful, improvised “Blues”; sketches a sparse, quiet playing of Karayorgis, opposed by the nervous rhythm section on “Neumes”, and concludes with the contemplative “Slack Tide”.